I’m a big believer in keeping a To Do List and have done so for as long as I can remember. It helps me stay focused and ultimately improves my output. Download the To Do List tool from the link below. It includes simple instructions, 4 templates, and an example. In the tool, there is a template for Daily, Weekly, Monthly, and Annual Initiatives. I normally use the Weekly To Do List and manage from a weekly set of tasks I want to accomplish. At times, I’ll use the Daily version but tend to fall back into the weekly template. Every weekend, I sit down to list the key things I need to accomplish in the coming week and place a priority on them. I use a simple priority method of A, B, or C for High, Medium, and Low. The to-do items aren’t listed in any real order, , , just put down as I think of them. 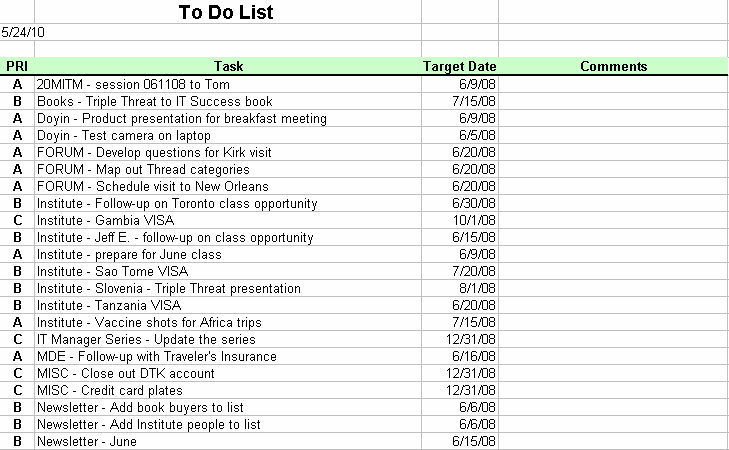 Once prioritized, I can sort them by priority so my focus in the week is targeted to the most important items. That’s a key point – be sure you determine what “has to be done” and organize your work week to take care of the essential tasks first, , , or early in the week. Otherwise, you can find yourself working on the more fun things and possibly less important issues and miss out on getting the truly important issues taken care of. Getting productive is about focus, but also about being disciplined to work on the most important issues first. By listing what you want to accomplish for the year and breaking it up into smaller segments (Monthly, Weekly, and even Daily if you prefer), it helps you stay focused to getting things done, , , and that’s what productivity is all about. I’ve used the Weekly version of this tool since my IBM days in the early 1980’s. It has worked very well for me and continues to make a positive difference in my productivity.